EUR/USD is tentatively holding psychological support at 1.15, brought back from the brink by speculation that the EU summit can produce a migration deal to appease Merkel’s coalition partners and the new Italian government. At the time of writing encouraging signs are emerging, and the EUR could derive if a little more support if the Christian Social Union party do indeed step back from an open confrontation with the German Christian Democrats. A quiet week for Eurozone data could help EUR consolidation. 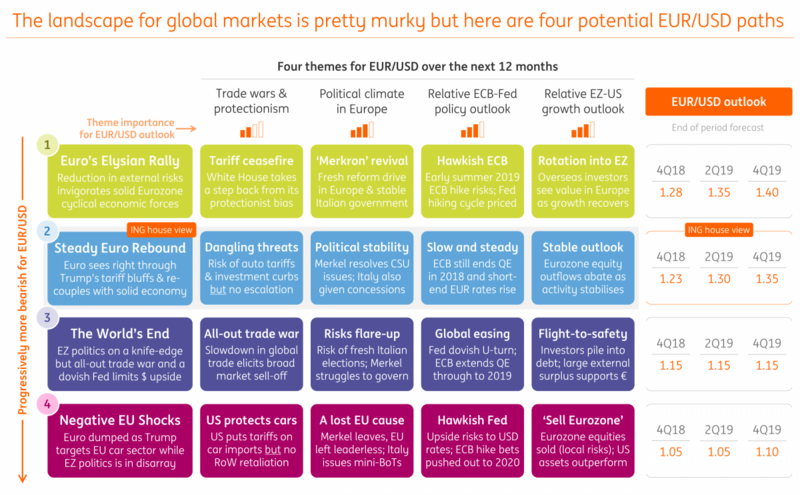 However, EUR/USD will have to face another onslaught of dollar positive macro news. ISM business confidence surveys look set to stay near cycle highs, and Friday’s US jobs release could see the unemployment rate at a new cycle low and wages staying firm near 2.8% year on year. Signs that the US economy is so far immune to Trump’s protectionism warns that the EUR/USD downside certainly remains vulnerable. There’s been a noticeable change in USD/JPY sentiment, where it looks like the Japanese yen is getting caught up in the Asian FX sell-off. Depending on where People's Bank of China (PBoC) fix USD/CNY in the week ahead and whether it starts to build the notion of a managed devaluation in Asian currencies, USD/JPY could be pressing some significant resistance just above the 111.00 area. A break-out is certainly a risk, especially were US jobs data to see US yields spike higher and emphasise the diverging nature of the US macro/policy differential with the rest of the world. The ability of US equities to hold up in the face of protectionism is going to be key going forward. USD/JPY traded steadily higher during the Asian crisis until US equities were finally caught in the cross-fire. GBP remains caught between a bullish Bank of England and a bearish Brexit trap - with the latter currently winning out as the UK government still tries to formulate its Brexit strategy. Trying to second-guess is proving to be futile - and we've outlined various potential sterling paths here: GBP: Theresa May's Impossible Brexit Trinity. The currency is looking quite vulnerable around some key levels - in particular, EUR/GBP posting a topside breakout after a trading a narrow range could see a follow-through to 0.90 if the Brexit newsflow turn sour for the pound. But aside from Brexit, the short-term forces for GBP have been pretty constructive; the Bank of England looks increasingly ready to hike rates in August should (a) domestic data hold up and (b) Brexit negotiations don't unravel such that the odds of a cliff-edge exit from the EU are high. On the former, the positive revision to 1Q UK GDP was a welcome relief - and given that relative growth differentials have been driving currencies in 2018, this story is mildly positive for GBP, but the outlook is still fragile. However, there will be a keen focus on UK PMI readings in the week ahead starting with manufacturing on Monday. Governor Carney will also be speaking on Thursday. Our base case remains that GBP/USD holds 1.30 - and that the direction of travel is towards 1.40. AUD: Could the RBA turn dovish like the RBNZ this week? The Reserve Bank of Australia are meeting next week on Tuesday and may get that extra bit of attention after both the Reserve Bank of New Zealand - and arguably the Bank of Canada - took a dovish turn over the past week. The escalating trade war between the US and China doesn't bode well for an Australian economy that is still somewhat synchronised to economic and trade developments in Asia. Moreover, AUD's high-beta nature means that it is vulnerable to any sharp sell-off in the stock markets. Away from the RBA, the week ahead sees PMI, trade and retail sales data, all due on Wednesday - although domestic data likely to play second-fiddle in the current environment. AUD/USD looks to be in a bearish channel since the start of the year; a breach of the 0.7300 level could open the floodgates towards 0.70. NZD/USD fell to a two-year low after the RBNZ's latest statement was judged to have had a dovish spin to it. The central bank noted that there was 'marginally more spare capacity in the economy than anticipated' after the latest weak NZ GDP readings - which suggests that policy could remain steady for the foreseeable future. Indeed, the RBNZ's prior mantra that a 'rate cut is equally as likely as a hike' lends itself to a pretty flat NZD OIS curve. However, given that there's now little room for markets to further re-price the RBNZ story, the kiwi will be a function of external global market dynamics. It's likely now that NZD/USD consolidates below 0.70 for the summer until trade war risks abate. While Bank of Canada's Governor Poloz noted the 'big picture' economic outlook warranted further policy tightening this week, he pretty much left markets guessing whether the Bank would raise rates at their next scheduled meeting on 11 July. Judging by the sharp swings in USD/CAD, investors weren't overly convinced that there was a clear hawkish message from the BoC chief - although the CAD has since drifted higher, with the probability of a July hike now at 70%. Before the July BoC meeting, the week ahead sees the latest Canadian jobs report, trade balance figures and Ivey PMI reading, all due on Friday. While the jobs figures have been inconsistent of late, Canadian wage growth has been on a tear (the latest reading at 3.9% YoY outstripping the US average hourly earnings equivalent). Should this remain elevated, then we'd expect a July rate hike to be a pretty close call - but going right down to the wire depending on how US trade policy and markets evolve over the coming weeks. The Riksbank policy meeting on Tuesday is likely to be a non-event. Having revised its rate forecast downwards in April, and with the outlook broadly unchanged there is little reason for the Swedish central bank to change its stance at this point. SEK may get some modest support as unchanged forecast will still point to a hike in 4Q18 – which we see as unlikely, but such support should be very short-lived. With the Riksbank to eventually by and large mirroring the ECB (hence a hike this year is unlikely) and the external environment being negative for SEK (which is a low liquidity currency of an open economy that is vulnerable to trade wars), we retain our highly non-consensus bullish EUR/SEK view, targeting 10.50 in coming weeks and 11.00 by the year-end. EUR/CHF has found some support under 1.1500, and we suspect the Swiss National Bank may be taking an interest here. CHF sight deposits are on the rise suggesting that FX intervention is on-going. Should European politics experience some warm after-glow after the EU summit, EUR/CHF could be carried towards the 1.16 area – given this year’s strong correlation with European politics. Locally the focus will be on Swiss PMI and then the June inflation data on Thursday. The latter is now expected to creep up towards the 1.1% YoY area. However, in the June policy update, the SNB revised the near term inflation profile higher on oil but cut the 2020 inflation outlook based on activity. Thus the market should be prepared for higher inflation over coming months. Like most other higher beta commodity currencies NOK has been feeling the heat of the escalating trade wars, with EUR/NOK breaking above the 9.5000 level (after briefly trading through the 9.40 level in the prior weeks). On the data front, we look for Norway's June manufacturing PMI due Monday to modestly increase. Coupled with oil prices remaining at elevated levels, this should provide some modest upside to NOK and partly (yet not fully) ease the effect of the external environment. In the relative value space, we continue to prefer NOK to SEK and look for the cross to persistently move above the NOK/SEK 1.1000 level in coming months.